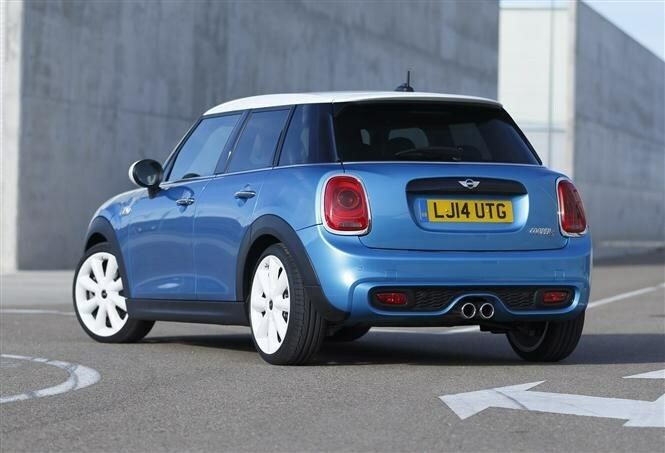 If you’re thinking this looks like a five-door version of the latest generation of MINI Hatch, then high five yourself. For the first time in its history, MINI’s smallest car is available with a conventional hatchback and a pair of rear doors for added functionality. What the latest version of the MINI Hatch isn’t is the existing three-door shell with a pair of extra doors shoehorned in. From the windscreen backwards, the bodywork is longer and taller, allowing proper functionality to be built into the new version. At 3,982mm long the five-door is 161mm longer than the existing three-door MINI Hatch, as well as being 11mm taller and riding on a wheelbase stretched by 72mm. That increased gap between the rear wheels has been given over entirely to rear passengers' legroom, who’ll be sat on a bench seat that now accommodates three passengers, admittedly with a slender one in the middle. Boosting practicality, the rear seat splits 60:40 with boot space ranging from 278 litres up to 941 litres with the seats tumbled. Extra space aside the five-door has all the features of its smaller sibling, including different driving modes and a wide range of customisation options. 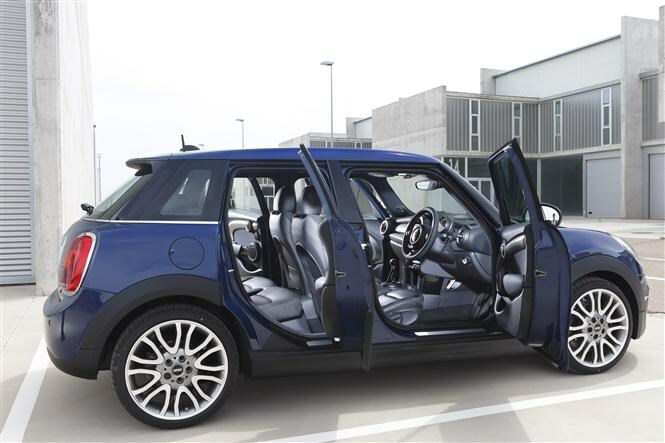 Mirroring the more expensive versions of the three-door range, the MINI Hatch five-door will be available in Cooper, Cooper D and Cooper S versions with the Cooper SD model making its debut on the new MINI for the first time. Power outputs are identical for the first three versions, with 134bhp, 114bhp and 189bhp respectively. The new Cooper SD features a four-cylinder, 2.0-litre diesel generating 168bhp, allowing the five-door Hatch sprint from 0-62mph in 7.4 seconds with a claimed average fuel consumption of 68.9mpg. All MINI Hatch five-door models come as standard with a six-speed manual gearbox, with a six-speed automatic optionally available. Prices for the MINI Hatch five-door start at £15,900 for the 1.5-litre petrol Cooper up to £20,050 for the latest Cooper SD. 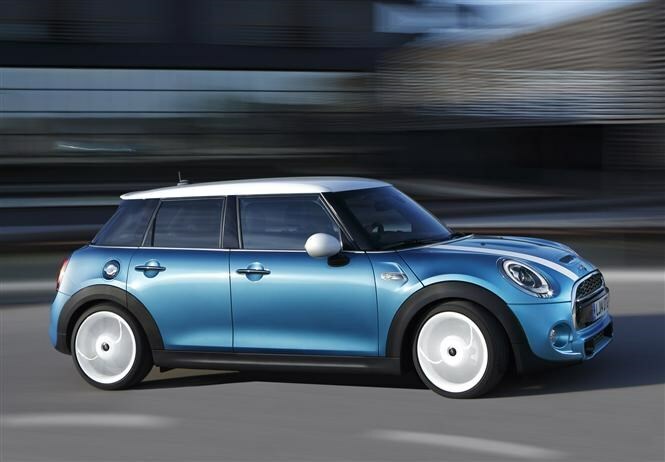 When sales begin in autumn 2014 customers will also be able to choose their new five-door in Electric Blue, a hue familiar from the first generation of new MINIs. 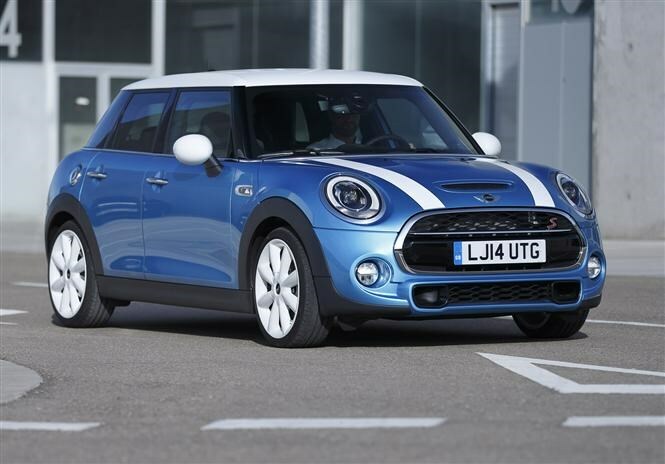 Check back soon to read Parkers detailed new MINI Hatch 5-door review and find out whether the new model combines charm and fun with practicality. 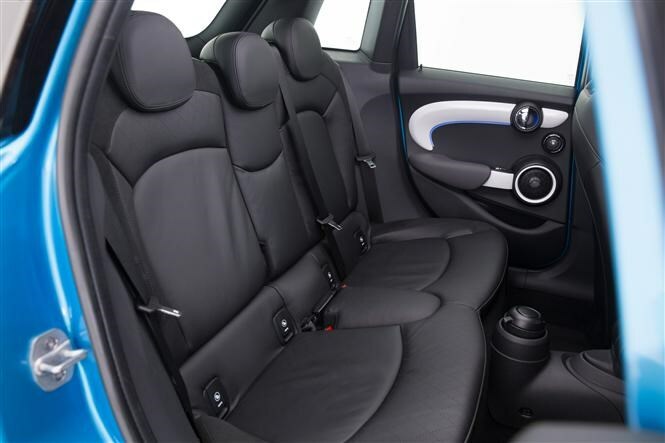 Familiar MINI Hatch nose is now attached to a taller, longer five-door body Electric Blue makes a return as a colour option on the five-door MINI Hatch Back seat of the five-door MINI Hatch will allow three to sit side by side. 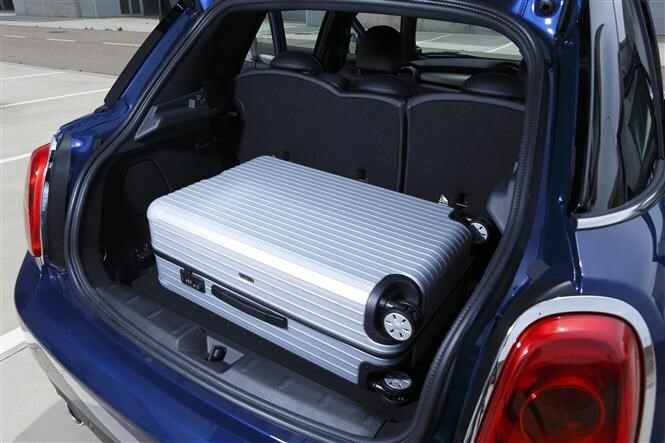 At a pinch MINI Hatch will come as a five-door from the autumn Cooper, Cooper D, Cooper S and Cooper SD versions of the five-door MINI Hatch will be available The five-door MINI Hatch has a larger boot and seating for five. Just.